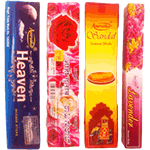 India has a rich tradition of using incense in many social and religious occasions since time immemorial. Incense sticks, also known as agarbathi and joss sticks, in which an incense paste is rolled or moulded around a bamboo stick, is one of the main forms of incense in India. Product of India.